In a recent report by the BBC it was revealed the UK College of surgeons is to introduce a new website where potential clients for private cosmetic and Weight Loss Surgery can check the qualifications of the Doctor and the clinic where they intend to have the surgery. You may ask why the college consider this to be a necessary step. In this article we reveal the reasons, read on and take note ! The Problem in the UK is that the doctors who actually carry out the surgery do not need to be qualified SURGEONS”. This also means that most of the private clinics who sell cosmetic surgery and weight loss surgery employ Doctors who need not actually be qualified surgeons. This is why the college of surgeons has found it necessary to publish the website where potential clients can check on the credentials of the Doctor before committing themselves to the surgery. Over the past few years there have been many well publicised cosmetic surgery problems, for example the “PIP” breast implant scandal which Involved several well known UK clinics, and in one instance involved a High Profile Harley Street Clinic which subsequently went in to voluntary liquidation to avoid facing up to its responsibilities and left the NHS to sort out the problem. They (the company in Question) then had audacity to open a new company from the same premises and use an almost identical name to start all over again ! So what are the Best Options for clients seeking bariatric Surgery and Cosmetic Surgery ? The answer is simple. You can have Private cosmetic and Weight Loss Surgery in France at a fraction of the cost and have the additional benefit of knowing that the person carrying out the surgery will be reassured that All of the surgeons who carry out surgery at the Hospital we use in Le-Havre in Normandie in Norther France are all highly qualified and respected leaders in the fields of Bariatric Surgery and Cosmetic Surgery with Many Years experience. Because of the easy of access from most areas of the UK it now quite easy to travel to Northern France by Car/ferry, Euro-star, or air from many airports in the UK. Price Advantages in France for Weight Loss Surgery. The average Price for Surgery in France is Much Lower that it is in the UK and even after taking in to account the cost of Travel you can still save many thousands of pounds for any private surgery. The revelations are astonishing ! The fact that any doctor can carry out complicated and dangerous cosmetic and weigh loss surgery in the UK is a bit scary !! 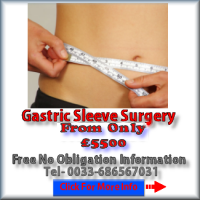 I would certainly recommend anyone considering gastric band, gastric bypass or gastric sleeve surgery to get in touch with Laser Clinic (France) Ltd at http://gastricbandfrance.com to save up to 40% on the cost of the surgery and be operated on by Highly qualified and experienced surgeons in the Largest French NHS Hospital in Le-Havre.